Automotive mechanics repair cars and light trucks, and they perform maintenance work on vehicles to keep them road-worthy and to avert major repair bills for customers down the road. Sometimes called service technicians, they held approximately 759,900 jobs in 2016. About a third of these workers were employed by auto dealerships. It isn't just about fixing vehicles. Auto mechanics have other responsibilities as well. Interact with customers to obtain information about the problems they're experiencing with their cars. Examine various systems within cars to diagnose problems. They run computerized diagnostic tests to help them identify components that might be malfunctioning. Remove parts that are worn or not operating properly and replace them with new or used parts. Perform routine maintenance like oil, filter, and belt changes according to schedules established by various car manufacturers. Explain repairs to customers and provide estimates for unanticipated repairs. Pitch optional repairs or preventative maintenance to customers to generate additional revenue for the shop, although this can depend upon the employer. Keep detailed records on all work performed. Mechanics who work for government agencies and automotive dealers and those who own their own businesses tend to earn higher than average salaries. Mechanics working for gasoline stations and private service outlets often earn less. Some service technicians earn a commission based on the amount of work performed while others receive an hourly wage. Some mechanics who work for garages or dealers also take on some private customers outside their work hours and location. Others look for cars with significant mechanical problems that they can purchase, fix, and sell privately at a profit to supplement their incomes. Auto mechanics have a variety of learning and training options, although they might not all be necessary. Education: Options for mechanics include an associate's degree in automotive technology or a related field. They should ideally hold a high school or vocational training program diploma. A college degree is not generally required. 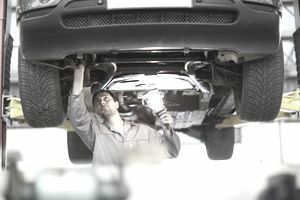 Apprenticeships: Either an apprenticeship working under an experienced mechanic or on-the-job training can be beneficial. Continuing Education: Mechanics must be willing to engage in ongoing learning to keep pace with changing technology as new models of cars are released with ever-evolving features. Workers in the automotive industry need a number of skills to help them maintain and repair cars, trucks and other vehicles, and to work with customers, managers, employees, and team members. Employers seek these skills in the candidates they hire for automotive jobs. Analytical abilities: These can help you conduct tests and inspections and to diagnose the causes of elusive car troubles. People skills: You'll be involved in customer service and customer relations. An eye for detail: Not only will this help with hands-on work, but it can be beneficial in other aspects of the job, such as recordkeeping and maintaining inventory. Coordination: Some work can require a great deal of manual dexterity and fine motor skills. Other work demands strength and agility. Leadership skills: You might be called upon to supervise or teach others. According to the Bureau of Labor Statistics, opportunities for automotive service technicians and mechanics are expected to grow by about 6% between 2016 and 2026. This is about as fast as average for all occupations. The number of vehicles on the road is expected to rise, but this will be offset by advances in technology and design that should enhance the reliability of vehicles and minimize the need for repairs. This job can entail some overtime. It's not always possible to clock out and walk away in the middle of a repair. Evening and weekend work isn't uncommon, and this is largely a full-time job. Some similar jobs involve working on different types of machinery and offer varying median annual salaries.